One easy way to make half square triangle units—also called HSTs and triangle squares—is to sew them on a long grid made from two strips of fabric. A triangle square is a popular type of patchwork that's made up of two right angle triangles sewn together on their longest edges to create a square. There are many ways to quick-piece half square triangle units, and the method you choose depends on preference, the fabric you have on hand, and the number of identical units you want to make. The grid assembly technique is perfect when you need lots of identical units. You can draw the grid on paper and pin it to sandwiched fabrics, draw it on freezer paper and press to a strip, or draw it directly on the reverse side of one fabric used to create the patchwork. Read all of the instructions before you begin. Determine how many squares you need. Each square in the grid produces 2 half square triangle units. Refer to your pattern or calculate the finished size of the triangle squares. Add 7/8 inches to the finished size to determine strip and grid width. For small triangle-squares, work with a size that's a little larger than necessary or sew with a scant quarter inch seam, because sometimes units end up a bit too small. When complete, trim the squares back to the correct unfinished size. To calculate total strip length, multiply the grid size by the number of squares required. Use shorter lengths of multiple strips if necessary to make the best use of your yardage. Cut strips of the two fabrics chosen for each type of identical units, their width as determined in Step 2 and their lengths as determined in Step 3. 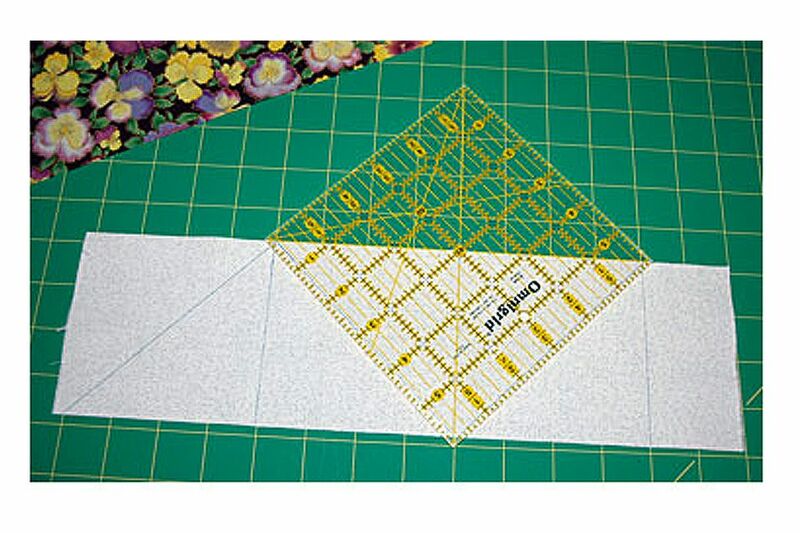 Use a rotary ruler to mark square segments along the length of the grid. The distance between each vertical line should be the same as the width of the strip. Align a horizontal rule line with the edge of the strip before you mark to make sure all vertical lines are perpendicular with the top and bottom of the strip. Align a 45 degree line on a square or long ruler with the top or bottom edge of the strip and draw a diagonal line to connect the first two vertical lines. See the photo on Page 1 and refer to the illustration above. Repeat to connect the next two squares, but draw the line along the opposite angle as shown. Continue marking until all squares are joined by diagonal lines. If you have a 1/4 inch presser foot you needn't mark the grid any further. If you do not have a 1/4 inch foot, use your rotary ruler to draw lines that are a scant 1/4 inch from each side of the angled lines you've already drawn. The new lines are seam lines. Align strips for your triangle square units, right sides together and all edges matched. Pin the strips together to keep fabrics from moving apart. Begin sewing at one end, placing your seams a scant 1/4 inch from the diagonal line that connects squares. Use your 1/4 inch presser foot to gauge the distance or sew on marked seam lines. Stop sewing and turn at each corner to change directions. Remove the unit from the machine and repeat to sew a seam a scant 1/4 inch on the opposite side of the original diagonal lines. Use scissors or rotary cutting equipment to cut units apart on the vertical lines. Repeat to cut each square in half along its original diagonal line. Remove papers if necessary. Place the units on the ironing board, darkest triangle up. Press open carefully and remove the little triangular nubs, called dog ears, at the end of each seam. Measure units with a square ruler to verify size. The ruler's 45 degree line should flow precisely along the line created by the unit's two triangles. Use the ruler to cut each unit back to its correct size if you constructed the triangle squares from oversized strips of fabric.